e45 has transformed a former distillery space into their new offices located in Milan, Italy. A design company working mainly on workplace solution wanted to express its creativity, innovation and communication skills through an inspiring office. This was the goal of e45 when the project started, with the research of the appropriate location. When the designers discovered the space (a former distillery for Fernet Branca) in the recently renewed and fashionable district of Milan, they fell in love right away. The idea was to leave the industrial flavour of the space intact and simply add systems and furniture with a gentle touch. When existing vinyl flooring was removed, e45 discovered original factory ceramic tiles underneath that have been smoothed and kept as imperfect as they were. The original windows have been updated for thermal insulation (double glazing) but kept in the original color and shape. The existing loading bay has been converted into a nice dehor, ready for aperitives, informal meetings in the good season period. 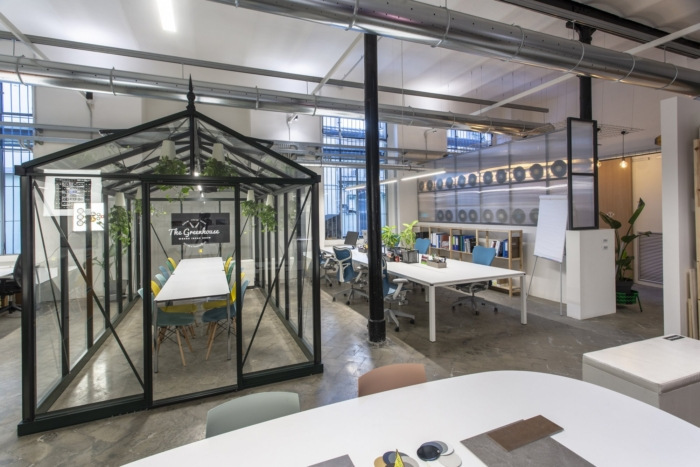 The entrance of the premise has a long table for meeting with suppliers or large informal meetings, with a translucent partition with a gallery of client’s name as old vinyl records collection. While looking for a partition made of translucent material, the designers discovered a splendid model of Victorian Greenhouse customizable for any use. They used it as main meeting room, keeping its transparency to enhance the space. All over the space the full catalogue of “smart working elements” has been used. Architects and designers do not have a dedicated workstation. Lockers are provided for individual storage. Other features include a phone booth for conference calls and project spaces with whiteboards and magnetic panels. The kitchenette is used in a versatile way for both confidential meetings and staff lunches. The pipework bookshelf and other ready-made items all over the space keep the mood of the former industrial space alive.